A timeless essay on writing by George Orwell. Bravo to each university on this list. Here. And here's an opinion piece worth reading. Long overdue but very happy news. Alan Turing has finally been given a posthumous pardon (here). Too many wonderful people have been punished for being gay--just for BEING gay. Very happy to see this news. Bravo, Brandeis and Penn State Harrisburg! Both universities said no to the boycott (here). Bravo, Michael Roth (President of Wesleyan U)! For his response to the American Studies boycott of Israeli universities (here). Bravo, Robert Brown (President of BU)! For his response to the American Studies boycott (here). His take on the ridiculous American Studies Association boycott of Israel (here). Where is the American Studies Association's boycott of China and other nations that make academic freedom a myth? I'm sorry, but I can't help but believe that anti-Semitism is at the root of this boycott. For speaking up about the academic boycott of Israel (here). Something funny, on this eve before grading exams. Boyd School of Law's upcoming Conference on Psychology and Lawyering is coming up early next year. Info here. Should be excellent. A feel-good donation opportunity for you from The Bloggess. Really? An academic boycott of Israel? Why the leaders of the American Studies Association are misguided. Here's the news story. Rather than either (1) trying to learn about the nuances of what's going on in the Middle East or (2) trying to engage their Israeli counterparts in a real discussion of the issues, the American Studies Association has voted in favor of an academic boycott. I'm willing to admit that good-hearted people on both sides of the Israeli-Palestinian issue have important and valuable things to say, and I'm willing to listen. I'm not willing to listen to academics who prefer to turn their backs, shut their eyes, and plug their ears in a grown-up version of "I'm not listening to you" behavior. So I received a copy of PLI's Financially Distressed Companies Answer Book 2013, and it's been waiting for me since June. For folks who have no background in bankruptcy law, it's a nice way to spot the issues and get some citations. It gives enough of a forest-trees look to be a good intro to the field. It's one of several books that provide good intros to bankruptcy law, like Charles Tabb's Bankruptcy Anthology, Michael Bernstein & Jack Ayer's Bankruptcy In Practice, and similar good overviews. Today's Throw Grammar From the Train is about "utilize"--yay! See here. I've been riding this particular hobbyhorse for a long time. My guess is that people use "utilize" to sound "educated." If I can get lawyers to realize that they write more clearly when they write as simply as possible, I will have done something useful. Yes, I believe that our law students at Boyd are cooler than your law students. This New York Times article on anti-Semitism brought back some painful memories. Growing up in the Bible Belt meant that I met more people than I'd have liked who really did believe that the Jews killed Jesus and that Jews were devils. Yes, I heard "show me your [devil's] horns--I know you have them." Yes, I was beaten up regularly (until I learned how to defend myself) for being Jewish. Yes, even my "friends" would say unkind things about my religion. The fact that anti-Semitism hasn't declined, and may in fact be on the rise again, is horrifying to me. But kids learn what their elders teach them, and--like every other type of prejudice--knowing that one of their friends is Jewish, or gay, or otherwise "different" from them may not be enough to help erase all of those years of teaching that "others" are evil. Yep, I'm bragging about Boyd. Three schools accredited in the past two decades -- the University of St. Thomas, Nevada–Las Vegas, and Chapman -- "have already made a scholarly impact that dramatically outpaces their present academic reputations." Congratulations to Brian Shapiro's FEES program! The 4th graders in this video did a great job of demonstrating the type of financial knowledge that Brian Shapiro's course teaches. What a great program! I agree with a lot of the points in this post about law reviews. Here. Law reviews are good for giving students more experience with good and bad writing (and good and bad analysis). But law students are still novices and can't be expected to have the same level of understanding of a given field that tenured professors have. (I seem to recall the wonderful Jack Ayer having written once about the irony of someone who couldn't get a C in a course telling an author that the author didn't understand the subject, but I can't find the quote.) We really should rethink the law review system. Another great post from LawProfBlog. All we want is to know our new dates for trash pickup. Seems easy, right? Go to the website, search by address, get info. Nope. We can get info on recycling (but we know our recycling dates). We can't get info from Republic Services about our trash pickup dates. We tried emailing. The first time, we got a very polite response saying "we'll be back in touch." That was on 10/15. Radio silence since then. So responding to the email saying "we'll be in touch" leads to a bounceback saying, essentially, n'il exist pas. Interesting approach. Want to place a bet on when (sorry, if) Republic Services cares to tell us when to put our trash cans out? Or should we just try the 1/7 chance and guess? I hate disagreeing with so many smart people, many of whom are friends of mine, but I really do disagree with the 500-law-professor letter to the ABA. Many good people signed this letter to the ABA (hat tip to TaxProf Blog) suggesting that the proposed change to Standard 405 (there are two different alternatives being proposed) would "cause a negative impact on academic freedom, the creation of safe space for dissenting voices, and recruitment and retention of minority law professors." I'm not convinced that those statements are accurate. time faculty. It does not require that all full-time faculty have the same form of security of position, and it does not require tenure. Proposed Interpretations 405-1 and 405-2 provide that a tenure system is a safe-harbor for satisfying the security of position required in Standard 405(d). For full-time faculty positions not covered by tenure, the law school must establish that its policies establish conditions sufficient to attract and retain a competent full-time faculty and protect academic freedom. competent full-time faculty sufficient to permit the law school to comply with the Standards. It requires policies to protect academic freedom of its faculty and provide for meaningful participation of full-time faculty in the governance of the school. Alternative 2 does not require tenure or security of position for any full-time faculty. harbor [sic] for satisfying the attract and retain provision and the academic freedom provision of Alternative 2. For full-time faculty positions not covered by tenure, the law school must establish that its policies establish conditions sufficient to attract and retain a competent full-time faculty and protect academic freedom. The egalitarian in me doesn't particularly like the fact that Alternative 1 "does not require that all full-time faculty have the same form of security of position," but that's an issue for another day. "[C]reativity and innovation in the classroom will be stifled if a teacher is overly concerned that her job may be jeopardized if she asks her students to tackle provocative topics." "Without the protections of tenure and its underlying value of academic freedom, the ability to write about potentially controversial subjects, such as racial and intersectional discrimination, civil rights, criminal justice, affirmative action, structural inequities in the tax system, and the role of corporations in public life, without fear of reprisal will be threatened." "Without a system of tenure, these teachers and scholars [who "engage in advocacy on behalf of unpopular causes"] could become subject to dismissal based solely on their views. "[Without the protection of tenure, s]tudents will go through law school without exposure to diverse, exciting, and enlightening ideas." I think that these statements, and many others in the letter, go too far. Many, many pre-tenured people and people on long-term contracts challenge their students, write on controversial issues, and engage in advocacy. Maybe those without tenure are holding their breath and hoping that they don't get fired for challenging conventional wisdom, but they're still out there, challenging it. So it can't be the case that tenure is the magic wand that suddenly gives someone permission to have independent and challenging ideas. Yes, I know that tenure provides all sorts of freedom for those who hold it, and I realize that I benefit from having tenure. Tenure protects everyone, not just people of color (another problem that I have with the letter), from being fired for exploring controversial ideas--or at least from being fired without plenty of due process first. But there are all sorts of non-tenure-based protections against discrimination. I'm no employment lawyer, but I'm pretty sure that a contract that spells out someone's job duties provides some protection for a person hell-bent on performing those selfsame duties to the best of his abilities. And tenure has its costs, too. There's an inherent contradiction between the desire to keep the costs of law school down in order to increase access (a good thing--setting aside the issue of whether the job market for graduates will rebound) and the insistence on maintaining a system that is responsible for much of a school's fixed costs. We are in a time where demand for law school has dropped precipitously, and we are merely tinkering around the edges of adapting to the new normal. Tenure protects the good and sincere, but it also protects those who are just "phoning it in"--who haven't written in decades, or who produce bad scholarship that has no hope of moving our understanding of law or the legal system forward,*** or who don't think of new ways to convey their knowledge to students. Barring meaningful post-tenure review, we are one of the few enterprises without any repercussions for malfeasance or non-feasance. I guess I just don't see why 10- or 12-year contracts with a presumption of renewal are so much worse than lifetime tenure, and what bothers me about the 500-professor letter the most is that I wanted to read arguments that were nuanced. Instead, I read lines like this: "Every school that grants tenure currently has the ability to reduce its fixed costs by curtailing hiring or declaring a financial exigency, among other options." Really? The way to solve the problem of fixed costs is to declare academic bankruptcy? That's just not a realistic option. So I'm disappointed and frustrated by the letter, in much the same way that I was disappointed and frustrated by some of the points made by the recent Task Force on the Future of Legal Education (also a subject for another day). I think that the people who wrote the letter are frustrated and scared that the inroads we've made in legal education risk being subverted if their schools end up with deans who don't treat the academic enterprise with respect. The solution likely comes with some hard thinking about how governance should work. The only good news I have is that folks on both side of these debates are coming to the debates with good intentions. That's not a bad start. * When I first heard Harold Koh tell this story, I spent a fair amount of time during the rest of his speech asking myself, "Do I even have an idea?" It took me a while to be able to identify mine (which, if you're curious, involves the intersection of lawyer behavior with a variety of topics), but then I was able to tune back into what he was saying. ** Of course, I write about cognitive biases, too, so the irony here isn't lost on me. *** And by "bad scholarship," I don't mean "scholarship that doesn't agree with my own world view." At every school at which I've worked, there have been people whose scholarship I didn't really understand (and there have been people who didn't understand mine). Most of the time, what I see is a general and accepting attitude of "well, it's not MY thing, but it seems well-reasoned and, in that person's field, I think it's moving the discussion forward." (And those few times at conferences when I do hear professors discuss some scholarship in derogatory terms, I more often hear them call it "doctrinal"--as if doctrinal analysis is worthless--or critique it for not being "inclusive" enough. I'm not particularly conservative, but I worry that some of the diverse voices that we're missing in the academy are conservative ones. If it's true that we tend only to hire people who are most like us, shouldn't we be worried that there seem to be way more liberals than conservatives on our faculties?) So I don't think that "writing controversial scholarship" is at risk with the ABA's proposal. Writing doctrinal or conservative pieces might be, if a school's governance structure is intolerant of the diversity of viewpoints. 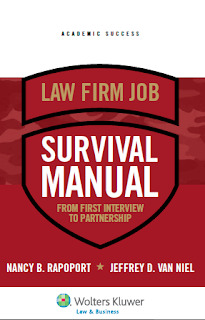 Our latest book, Law Firm Job Survival Manual, is out now! We're happy with it, and we hope that you will be, too. You can get it here, and our blog accompanying the book is here. Here. Hat tip to The Faculty Lounge and Michelle Meyer. Just one day after the anniversary of JFK's speech at Rice, this great news from NASA. Here. For JFK's speech, see here. She's receiving the 2013 Michael R. Roser Excellence in Bankruptcy Award from the Commercial Law Committee of the Missouri Bar, which recognizes an attorney who manifests the highest standards of excellence in bankruptcy practice, who contributes distinctively to the development and appreciation of bankruptcy law, and who has made an outstanding contribution in the field of bankruptcy practice or administration. The award is named in honor of the late Michael R. Roser, a prominent Kansas City bankruptcy lawyer. Well, THIS was a nice surprise about my latest Connecticut piece. 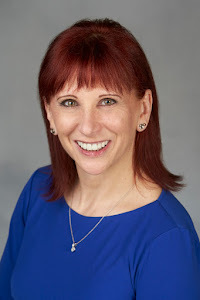 Nancy Rapoport, Rethinking U.S. Legal Education: No More Same Old Same Old, 45 Connecticut Law Review 1409 (2013). Professor Rapoport begins this article with the well-supported premise that, "Teaching students how to think about the law is no longer-and probably never was-enough." But she doesn't stop there. The article presents a well thought out, empirically supportable, alternative to the current, typical (and empirically unsupportable) law school curriculum. Law School, according to Professor Rapoport, should be divided into three distinct phases, each with a specific outcome in mind. 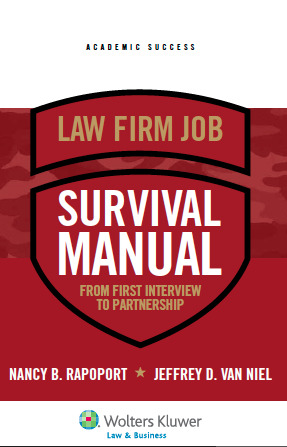 This outcome based curriculum provides lawyers with the actual skills they need to be practicing lawyers rather than the very limited skill of gleaning fine details from court opinions honed by the Socratic Method." The aim of the first year of law school should be dedicated to "Creating the Skilled Novice." The second year of law school should result in students becoming "Novice Problem Solvers." Finally, the third year of law school should be devoted to "Creating a Novice Professional with Basic Judgment." Professor Rapaport describes in detail the aspect, aims, and characteristics of this three-phased law school curriculum. "Law Professors have a cushy life." In our current, high-salaried jobs, "we get to study what we want" and we don't have to worry about putting "the client's interest first." Most law professors are blissfully ignorant of education theory and research. Law schools reward the production of scholarship rather than the "painstaking amount of time it takes to think seriously about the curriculum, develop new courses that reflect the building of skill sets over time, determine better ways to evaluate whether a student is actually developing those skills, and recalibrate the curriculum," if outcomes are not being achieved. The larger and more troubling question is whether perpetuating the inertia driven Socratic, legal education charade has now become an ethically questionable endeavor in light of the sound and copious educational research compiled against it. A colleague of mine suggested that the real reason for the adherence to discredited methodology in legal education is laziness. Surely that can't be right, even though I have not heard a more credible alternative for the resistance to change. A short interview about bankruptcy fees on Morning Marketplace. Some great new tools by my buddy Walter Effross. Here and here. I think they're both "must reads" for law bloggers. Bravo, Walter! A shout-out to a wonderful lawyer. Patrick Driscoll took on a case that I feared was hopeless, thanks to the client's former lawyer. Patrick stepped in, fixed the multiple mistakes that the prior lawyer had made, and got the client's plan confirmed. BRAVO, Patrick, and thank you! Robin Roberts is one classy person. An answer to those of you who make fun of my email signature on my UNLV email. Here. Hat tip to MoneyLaw and Jeffrey Harrison. Awesome promo w/my buddy Larry "Bubbles" Brown! And thank you for the shout-out, TaxProf Blog! Thanks for the shout-out, Law Librarian Blog! There are lots of stories about the DLA Piper partner who has been charged (not yet adjudicated, though--just charged) with charging clients for unusual expenses while he was a partner at Sidley Austin (see here, here, and here). They remind me of the dynamic surrounding John Gellene at Milbank (see my paper reviewing Mitt Regan's book, Eat What You Kill, here). All organizations get the behavior that they reward. The Wall Street Journal's Jennifer Smith reports that law firms are increasing rates again (here). I'd love to see those studies mentioned in her article. The issue of raising rates is, of course, tied to whether those higher rates are collectible. I could raise my rate to $10,000/hour, but I don't think I could collect any fees at that rate. And in those practice areas in which rates are reviewed by courts (like my own area of bankruptcy law), raised rates are not a slam dunk. I'm looking forward to following this story. Now compare that story to the one that just broke about Weil, Gotshal & Manges laying off sixty associates (here). That leads credence to my suspicion that, although rates may be going up, the ability of any law firm to collect 100% of the bills based on those new rates may not be going up. Lois Lupica and I just published an article in the ABI Journal on how best to work with fee examiners in chapter 11 cases (here). Given the recent publication of the new USTP fee guidelines in larger cases, we think that our article is particularly timely. We hope that you do, too. Hey, thank you, Credit Slips! Lois and I had a blast guest-blogging (and Lois did all of the heavy lifting). This morning's Wall Street Journal article on the costs and benefits of bankruptcy examiners. Here. Among the article's points is that the cost of an examiner has to be compared to the benefits. That's different, I hope, from demanding that the examiner find enough "bad things" to completely offset his costs. The idea of "funding by bounty" creates a bad incentive to look at trees instead of forests. But I've seen good examiners (and good fee examiners) in action. The ability to figure out what went wrong is a necessary part of a reorganization that's successful in the long term. And to do that, someone needs to be tasked with taking a good, hard look at what happened to create the need for a bankruptcy filing. I particularly enjoyed the quotes from William Snyder, now at Deloitte, who's been one of the best CROs I've seen over the years. His common-sense approach, and his ability to deflect what is often very nasty and personal comments as he's working out causes and solutions, is what makes him good. But back to costs and benefits. I'm an occasional fee examiner (yes, and a law professor who studies fees, among other things). I don't think of myself as saving a lot of monetary costs. Do I find things that should be cut or reduced? Sure. Professionals make mistakes, either clerical or in judgment, and typically they're comfortable fixing those mistakes themselves before I have to bring them to the court's attention. What I do save is time--the amount of time that my team and I spend going over fee applications is time that a busy and understaffed court really can't devote to the same line-by-line review. Bottom line? Look at the need for an examiner and figure out in advance what goals you want that examiner to achieve. Make sure that those goals are in the order authorizing employment, and monitor the progress of the examiner's work. And make sure those goals are aligned with the incentives for compensating the examiner. Avoid a bounty approach, and you're likely to get what you need to get from your examiners. A law firm that has given up on hourly billing. I thought that this post might raise some eyebrows (in a good way). The law firm that announced its rejection of hourly billing is Juan R. Gonzalez PLLC. This mock deanship application letter cracked me up. ABI National Ethics Task Force Report--Limited Scope of Representation (up on Credit Slips). My Conn. L. Rev. piece on legal education is out. Lois Lupica and I are guest-blogging at Credit Slips about the ABI's National Ethics Task Force Final Report. Here's the first post, and here's Bob Lawless's very kind intro. Update on my Gonzaga piece on law schools, lying, and Enron. [Y]ou refer to St. Thomas Law School as having done “the right thing and ‘fessed up when it discovered that it had been misrepresenting its placement data.” This is an important paper on an important topic, and I’m glad you’re tackling it head on. I fear, though, that this line may lead readers to lump St. Thomas in with other law schools that have shown a pattern of deliberate misrepresentation. Our oversight was a one-time occurrence that resulted from an erroneous entry of data. Specifically, on line 169 of our Class of 2010 U.S. News Employment data report, the number of graduates known to be employed at graduation was correctly listed as 51 graduates (or 32.9% of our 155 total number of 2010 graduates). Unfortunately, on line 164 of the report, we incorrectly listed 125 graduates (or 80.6%) as employed at graduation. U.S. News listed that incorrect number in its law school rankings. We immediately contacted U.S. News to alert them to the error. The nine month graduation rate of 86.5% was correct in the rankings. We did make a one-time mistake, and we paid the price by being unranked for a year. I’m hoping to avoid leaving the impression that we are another example of law schools trying to fudge the truth over a period of years. I'm happy to help Dean Vischer clarify his school's role. There's a huge difference between making a mistake and engaging in a pattern of deception. It's official--the new bankruptcy fee guidelines are rolling out on July 1. How to make a teacher feel wonderful. Paul Horwitz on the legal education crisis. For my law faculty colleagues--something free. I am so proud of my dad! I so wish this were an April Fool's Day story. All is right with the world this morning. Darn it! I missed National Grammar Day. Rutgers-Newark's law dean is right (updated). Yeah, thanks a lot, Dallas Morning News.